A fuel source is burnt, generating heat. This heat causes the air in the turbine to expand, building pressure. The pressure of the expanding air turns a turbine. The motion of this turbine can be connected to a generator which creates electricity or harnessed and used for motion. Gas turbines are commonly used in transportation and in industrial processes, powering everything from planes and ships to heavy machinery How Stuff Works (2015) "How Gas Turbine Engines Work"http://science.howstuffworks.com/transport/flight/modern/turbine1.htm How Stuff Works (2015) "How Gas Turbine Engines Work"http://science.howstuffworks.com/transport/flight/modern/turbine1.htm How Stuff Works (2015) "How Gas Turbine Engines Work"http://science.howstuffworks.com/transport/flight/modern/turbine1.htm How Stuff Works (2015) "How Gas Turbine Engines Work"http://science.howstuffworks.com/transport/flight/modern/turbine1.htm How Stuff Works (2015) "How Gas Turbine Engines Work"http://science.howstuffworks.com/transport/flight/modern/turbine1.htm How Stuff Works (2015) "How Gas Turbine Engines Work"http://science.howstuffworks.com/transport/flight/modern/turbine1.htm . 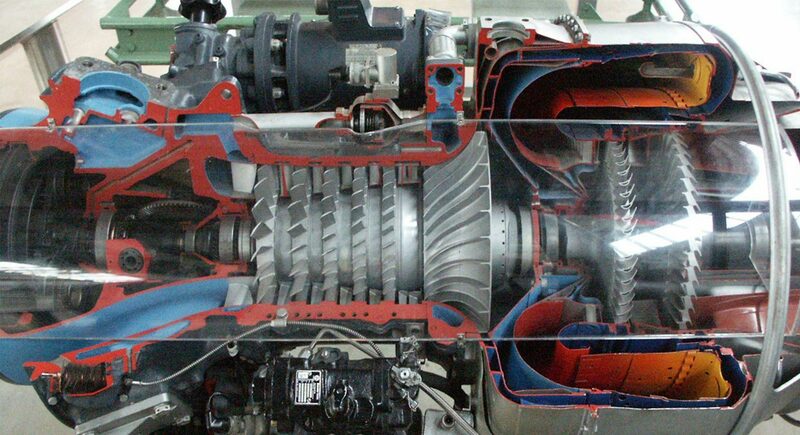 Gas turbines are a type of internal combustion engine. This is because the air pressurization is done in the turbine by the burning of a fuel source. Another example of an internal combustion engines is a diesel engine. Unlike many other types of turbines, gas turbines are ‘continuous combustion engines'. This is because the turbine is constantly pulling in fresh air, compressing it and using it to generate power Langston and Opdyke (1997) "Introduction to Gas Turbines for Non-Engineers" http://files.asme.org/IGTI/Knowledge/Articles/13051.pdf Langston and Opdyke (1997) "Introduction to Gas Turbines for Non-Engineers" http://files.asme.org/IGTI/Knowledge/Articles/13051.pdf Langston and Opdyke (1997) "Introduction to Gas Turbines for Non-Engineers" http://files.asme.org/IGTI/Knowledge/Articles/13051.pdf Langston and Opdyke (1997) "Introduction to Gas Turbines for Non-Engineers" http://files.asme.org/IGTI/Knowledge/Articles/13051.pdf Langston and Opdyke (1997) "Introduction to Gas Turbines for Non-Engineers" http://files.asme.org/IGTI/Knowledge/Articles/13051.pdf Langston and Opdyke (1997) "Introduction to Gas Turbines for Non-Engineers" http://files.asme.org/IGTI/Knowledge/Articles/13051.pdf . Sorry, we do not yet have a video specifically for Gas Turbine. We are adding new videos to StudentEnergy.org weekly, but in the meantime check out this video on Electricity.